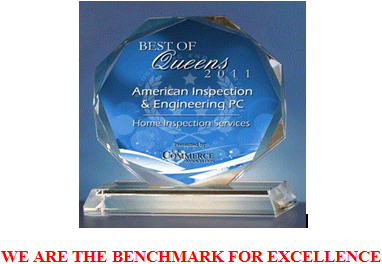 Our Company has been selected by the US Commerce Association as the 2011 Best of Queens Award winner in the Home Inspection Service s. American Inspection and Engineering PC was also recognized for outstanding local businesses that serves our communities and achieved exceptional marketing success in building inspections category. We constantly strive to provide a quality service for our clients by providing competent and thorough inspections and reports, keeping abreast of current inspection techniques and procedures. American Inspection & engineering PC is a fully qualified to conduct residential and commercial inspection services that protects buyers before buying a property. Through our background, education and training in residential and commercial inspection process, we can provide the buyers with accurate and thorough visual inspection services on any size building. Our thorough inspections are performed by licensed professional engineers. Our written reports detail any visual findings that could affect the sale of the property. We also provide recommendation and improvement list that can be used as barging tool along with general cost estimate. To avoid conflict of interest, our engineers neither solicit work nor recommend any repair services. You can expect prompt service with reports delivered to you without delay. When the buyer or the seller requests an inspection, please call the experts, where you are guaranteed fast, reliable service at reasonable rates. We provide Structural analysis, Flood Damage Assessment for Homeowners and Insurance Companies, Drainage analysis, Wet basements examination, and foundations evaluations.